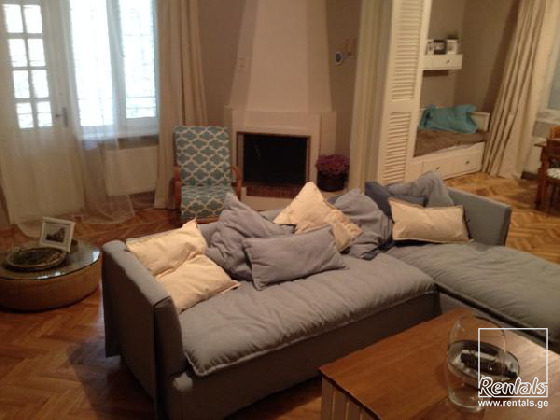 Quiet 2.5 bedroom apartment in Vake for rent One-of-a-kind apartment in the center of Tbilisi. It consists of: a very big living room (that can be split by a sliding door to create a half-bedroom for guests), two bedrooms (one with a walk-in closet), two bathrooms, kitchen and an entrance hall. It is located on a ground floor of a building in a quiet yard between Paliashvili and Abashidze streets. This spacious (140m2) apartment is furnished with hand-made, non standard design furniture, has high class equipment, cable TV (smart TV) and WiFi internet connection. Big assets of the apartment are private parking for two cars and a garden. Right now the living room, kitchen, two bathrooms and one bedroom are fully equipped. The other bedroom will be furnished according to the tenant’s needs (another bedroom, kid’s room, working room…). The apartment is available from the beginning of September.